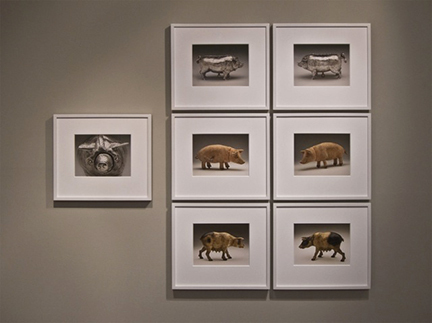 Barbara Edwards Contemporary is pleased to present Death to Pigs, a new work by Canadian artist-curator Ydessa Hendeles. 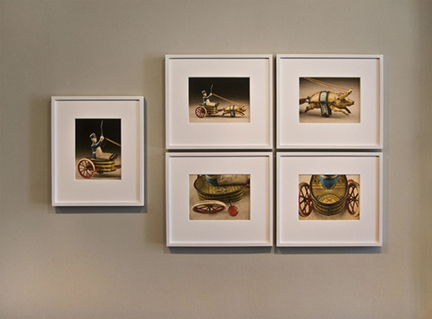 This is Hendeles’s first show in Toronto since the renowned exhibition space of the Ydessa Hendeles Art Foundation closed in 2012 after providing a contemporary art programme for 25 years. Since then, the Toronto- and New York-based artist has had major exhibitions of her work in leading museums in London, Tel Aviv and New York. In Death to Pigs—the title references the infamous Manson Family murders in the summer of 1969—Hendeles continues her exploration of our social and political capacity to put constructive, sometimes utopian, forces to destructive ends. This perverse duality runs through our history, turning hopefulness into hopelessness, empathy into apathy, and the social outsider into a non-person. 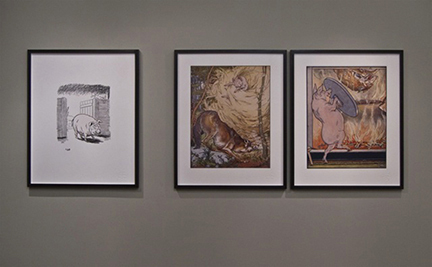 The central image in the show is that of the domestic pig, an animal figuring prominently in world culture in everything from sacred religious observance to fairy tales and mass media. 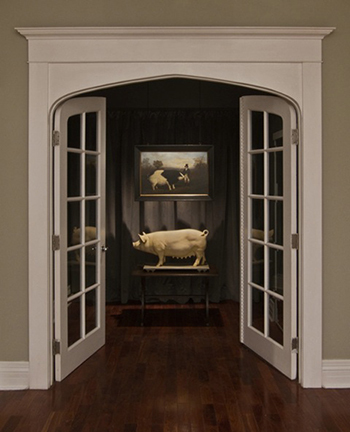 Though ranked higher in intelligence than dogs and cats, the pig stands as a metaphor for negative human qualities and for human groups considered beyond the pale of social norms. 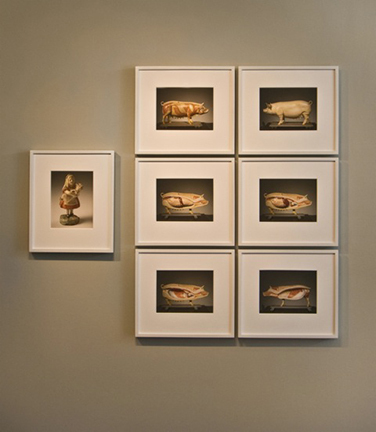 Working with a tightly choreographed assemblage of art, artefacts, photography and audio-visual, Death to Pigs is a provocative, psychologically charged meditation on human nature. Hendeles has gained an international reputation as a pioneering exponent of curating as a creative artistic practice, and, deliberately erasing the lines between collector, curator and artist, has fashioned her own distinctive space in the contemporary art world. Recent exhibitions include: Marburg! The Early Bird! at the Marburger Kunstverein (2010); The Wedding (The Walker Evans Polaroid Project) at Andrea Rosen Gallery in New York (2011); THE BIRD THAT MADE THE BREEZE TO BLOW at Galerie Johann König in Berlin (2012); and From her wooden sleep…, first shown at London’s Institute of Contemporary Arts (2015) and this summer revised and restaged in the Helena Rubinstein Pavilion for Contemporary Art at the Tel Aviv Museum of Art (closing Oct. 24). An artist’s book documenting the original staging of From her wooden sleep…, curated by Hendeles and presented with a full exhibition listing, her "Notes" on its components and an audio CD, was published this year by Hatje Cantz Verlag, Berlin. 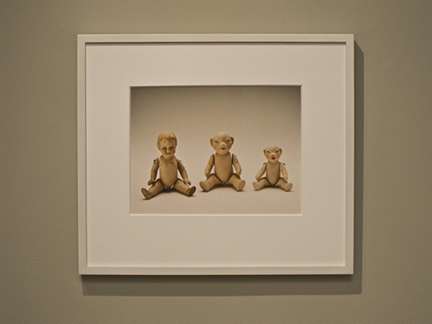 In 2003, Hendeles guest-curated Partners at the Haus der Kunst, Munich, a 16-gallery exhibition that included her own work, Partners (The Teddy Bear Project). 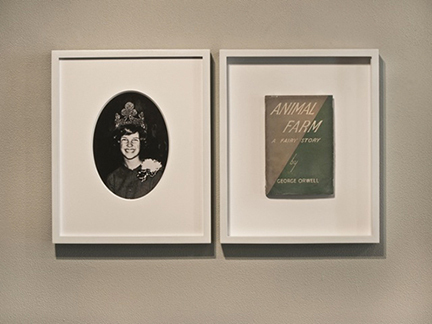 Built around an archive of family-album photographs and vitrines featuring photographs of teddy bears with their original owners, the project was first seen at the Ydessa Hendeles Art Foundation in Toronto in 2002, and was later remounted in Noah’s Ark by the National Gallery of Canada (2004), in 10,000 Lives, the 2010 Gwangju Biennale, South Korea, and most recently in The Keeper at the New Museum, New York (closing Oct. 2). Click here to read the review in ArtForum. Click here to read the review in New Yorker. 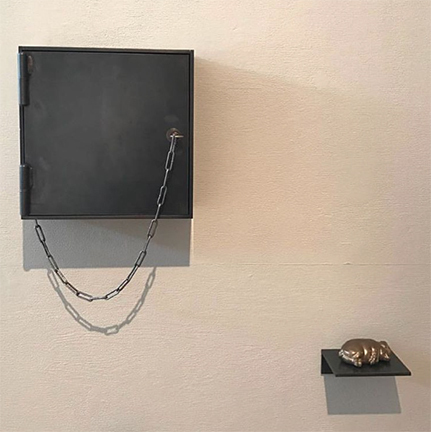 Ydessa Hendeles: Dystopia, Trump and Twitter, Evan Pavka of Canadian Art reviews "Death to Pigs"
installation dimensions: 116" x 36" x 24"
installation dimensions: 14 1/2" x 24 9/16" x 1 3/8"
installation dimensions: 30 3/4" x 53" x 1 1/2"
seven pigment prints on archival paper, framed in hand-painted white poplar frames, installation dimensions: 46 5/8" x 55 5/8" x 1 1/2"
installation dimensions: 32 3/4" x 88 1/2" x 1 1/2"
installation dimensions: 46 5/8" x 55 5/8" x 1 1/2"
frame: 16 3/4" x 19 1/8" x 1 1/2"
installation dimensions: 22 3/8" x 35" x 4 3/4"